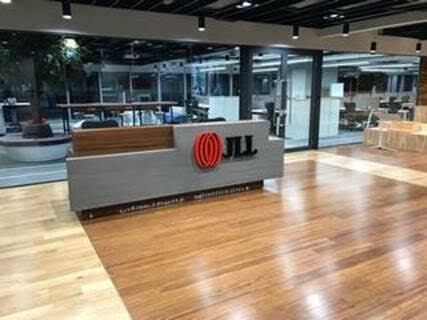 In line with the Firm's constant quest to further improve its staff and clients' experience as well as encourage collaboration and innovation, India's largest property consultancy JLL has relocated its Mumbai office to ONE BKC in Bandra-Kurla Complex as of 31 July, 2017. The new office provides a trendy, highly tech-enabled environment with collaborative zones spread over 22,000 sq.ft. of prime, 100% environmentally sustainable work spaces in the financial capital's new de facto CBD of Bandra-Kurla Complex. The new office has been specifically designed to provide a superlative workplace experience to boost productivity in tandem with employees' wellbeing. In the face of increasingly evolving client expectations, this new office space is a live model of the Future of Work - a concept which will be the base for future modern workplaces, of which JLL is a strong advocate in this age of disruption. Mr. Ramesh Nair, CEO & Country Head, JLL India says, "JLL's global 'people first' workplace culture puts the needs of its employees and clients ahead of all other considerations. Our cool new office in ONE BKC amply reflects this philosophy, and is the epitome of impeccable interior design and layout, ultra-modern comforts and conveniences as well as sustainable Grade A real estate. With the launch of this new office, we are rededicating ourselves to those who matter the most to us - the people who work for us, and the people we serve." BKC is Mumbai's newest and fastest-growing central business district and is perfectly equipped to serve Mumbai's needs for prime commercial space in the future. ONE BKC is particularly well-located in the center of Bandra-Kurla Complex, in the neighbourhood of several large multinational and Indian conglomerates as well as schools, healthcare facilities, consulates and more. JLL India's new office incorporates the latest technologies and design trends which achieve the objective of simplified day-to-day operations by encouraging collaboration, knowledge-sharing and innovation. Spacious and generously endowed with employee comforts along with best-in-class productivity-boosting elements, the office also surpasses industry standards of green buildings and is targeting LEED V4 Commercial Interior certification. With an unwavering focus on employee wellness, JLL's new office at ONE BKC also incorporates a fully-equipped gym, jogging track within the office, a themed cafeteria, babyteria and various other features. Smart technology has been applied to boost productivity in a fun, stress-free work environment. Every meeting room is enabled with video conferencing facilities, employees enjoy the convenience of app-based personal lockers to avoid desk clutter. The new office has a dedicated seating capacity of 200 desks including hot desks, ceiling-mounted microphones for audio / video conferencing as well as a high-performance modular partition system which simultaneously boosts room acoustics, and uses ergonomic furniture at every level. JLL India will eventually deploy this new model of high-tech enabled workplace throughout its offices all over the country. The Firm will also showcase this Centre of Excellence as an innovative workspace model for deployment by its clients going forward.